Soak in the peaceful and quaint ambience of a local teahouse as experts demonstrate the art of tea-brewing. We may also have seats rotations to enhance your opportunity talking to different people. To add little more flavour to the session, we will play some funny riddles. Cost: $12 or $24, includes Chinese Tea and light snacks. Will be $12 for those with sufficient sdncredits. Require prepayment of this amount by fund-transfer. But please do not make payment until you are advised to do so. Organiser will decide the types of tea and snacks to order. Port Dickson (PD) is a coastal district in Negeri Sembilan, Malaysia. Facing the Straits of Malacca, PD is well-known for its sandy beaches. On the second day, we will visit Malacca for sightseeing, shopping, and food. To enhance interaction amongst participants, 1 to 1 seat rotations will be conducted on the first day in the coach as we travel from one site to another. ii) by 7:45am at "Private Bus Pick-up point" of Jurong East MRT. Please ensure that your passport has at least 6 months validity from date of departure. For those who like to opt for group insurance, please provide your passport details by 10 Oct (Wed). After the deadline, we will not assist anymore applicants with group insurance. i) 7:15am to 7:25am: gather at Newton MRT for taking of attendance and board the coach. I will be there. ii) At 7:45am, our coach will reach Jurong East to pick up those who prefer to meet there. vii) Rest, explore the surroundings, enjoy sunset sceneries, etc. In evening, proceed to town area for dinner at own expense. ​iii) Checkout resort. Proceed to Malacca. v) Activities in Malacca include going to Jonker Street (famous for its Chicken Rice Ball, Nyonya Laksa, Durian Chendol, Pineapple Tarts, local products), Dutch Square, Formosa Fortress, St. Paul’s Church, Melaka Megamall, etc. vii) Around 9:30pm: back in Singapore via Second Link or Woodlands. Coach will provide dropoff at one or two MRTs. 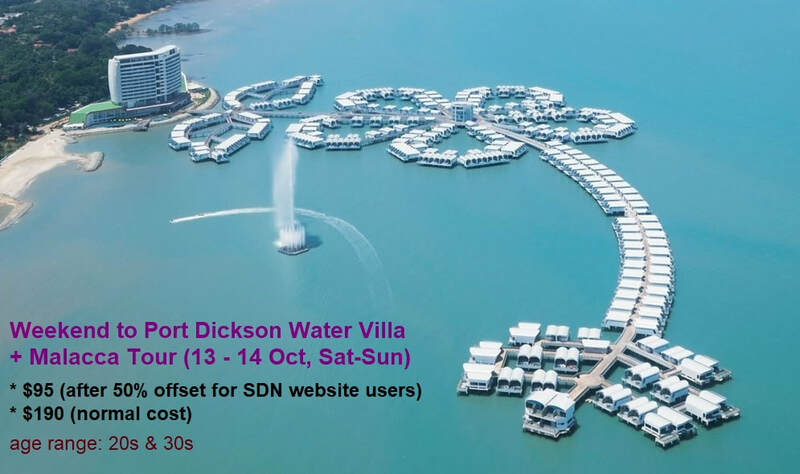 Register for Port Dickson event! Like to enjoy some 'Oishii' food and befriend like-minded people? Then join this dinner and speeddate event. A Choice List will be issued for participants to choose the ones they wish to know better or to build connection. Results will be privately made known to respective participants via email. Venue: In a Japanese restaurant in town. Disclosed only to confirmed applicants. Cost: $18 or $36, includes dinner. Will be $18 for those with sufficient sdncredits. Require prepayment of this amount by fund-transfer. But please do not make payment until you are advised to do so. Register for Japanese Dinner event! Spend your weekend enjoying lush green landscape and fresh air. We will be staying in a large, luxury villa near the foothills of Genting Highlands. Facilities in the beautiful villa include indoor swimming pool, karaoke, pool table, darts, jacuzzi, etc. We don't have to climb slope to reach the villa as the coach can reach its doorstep. Itinerary includes visit to Genting Highlands, the charming town of Bentong for food and Chamang Waterfall, and also quick shopping in Kuala Lumpur. Cost: $80 or $160. Will be $80 for those with sufficient sdncredits. Require prepayment by fund-transfer. But please do not make payment until you are advised to do so. - 1 night accommodation in hillside villa, with aircon rooms. Please ensure that your passport has at least 6 months validity from date of departure. For those who like to opt for group insurance, please provide your passport details by 17 Oct (Wed). After the deadline, we will not assist anymore applicants with group insurance. i) Reach Bentong town in morning. Own breakfast, food hunt, go Morning Market, Mural Art street, etc. 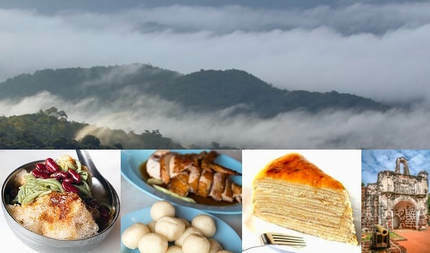 Bentong is well known for ginger, so you may consider savouring its ginger-flavoured dishes. ii) Proceed to Chamang Waterfall. It's a scenic site of lush greenery, series of waterfalls, strong streams, smooth rocks, and a suspension bridge. There are also calmer pools that you can dip in its cool water. RM2 entrance fee. iii) Proceed to midpoint of Genting Highlands. From there we will take Skyway Cable Car ride to the peak of Genting Highlands. Own expense of RM8 per way. Enjoy the nice view during the ride. For those who are keen, you can alight at Chin Swee Temple station for sightseeing and then continue the ride to the peak. v) Check in villa. The rooms are spacious, with aircon and multiple-sharing of same gender. Rest and relax. vi) In evening, maybe we will go for own dinner at a nearby town. vii) Back to villa. Night activities includes: in-house Karaoke, play pool, darts, games, mingling, etc. i) Breakfast in villa. Sometimes there are scenery of misty mountains in the morning. ii) Own activities, walk around the hillside, enjoy the indoor swimming pool, etc. iii) Checkout villa. Go for quick shopping and own lunch at KL city. iv) Proceed for sumptuous dinner at Yong Peng. It will be a Chinese style dinner. v) Around 9:30pm: back in Singapore via Second Link or Woodlands. Coach will provide dropoff at one or two MRTs. Register for Luxury Villa & Genting event! Meet and connect with new friends over a hearty dinner. Just relax and spend your evening chit-chatting with new friends. There will be seat rotations for you to dine and interact with different people. Register for Pizza Pasta event! ** Few slots for guys. Closed for ladies. ii) 9:15am at Woodlands Checkpoint. ii) Customs clearance via Woodlands Checkpoint. For those going Woodlands Checkpoint on your own, please reach Departure Hall by 9am and proceed for passport clearance. xi) Around 10pm: back in Singapore. The coach will do a first stop at either Marsiling or Kranji MRT, and then to Newton MRT.